We are expanding our succulent program by leaps and bounds! Huge Perennial selection and many new varieties of annuals and vegetable plants, herbs, airplanes etc. We are busy growing so please excuse the mess, as we are working on many projects and improvements this year! Gift certificates are always available. We are open mid-April through October. Please note that our hours change throughout the season; for current hours, please call us at (814) 364-2881. We are about 11 miles from downtown State College; 1 mile outside Centre Hall on Upper Brush Valley Rd./W. Church St.
From State College, via Rte 45: Head east on PA-45 to Old Fort intersection (Snappy’s on the right), turn left at light onto PA-144 and continue through town of Centre Hall. At the next light (Brother’s Pizza on left), turn left onto W. Church Street and continue about a mile. Turn right into parking lot. From Lewisburg, via Rte 45: Head west on PA-45 to Old Fort intersection (Sheetz on left), turn right at light onto PA-144 and continue through town of Centre Hall. At the next light (Brother’s Pizza on left), turn left onto W. Church Street and continue about a mile. Turn right into parking lot. From State College/Pleasant Gap/Bellefonte, via Rte 144: Head south on PA-144 from Pleasant Gap to Centre Hall. At base of Centre Hall mountain (Brother’s Pizza ahead, on right), turn right onto W. Church Street and continue about a mile. Turn right into parking lot. 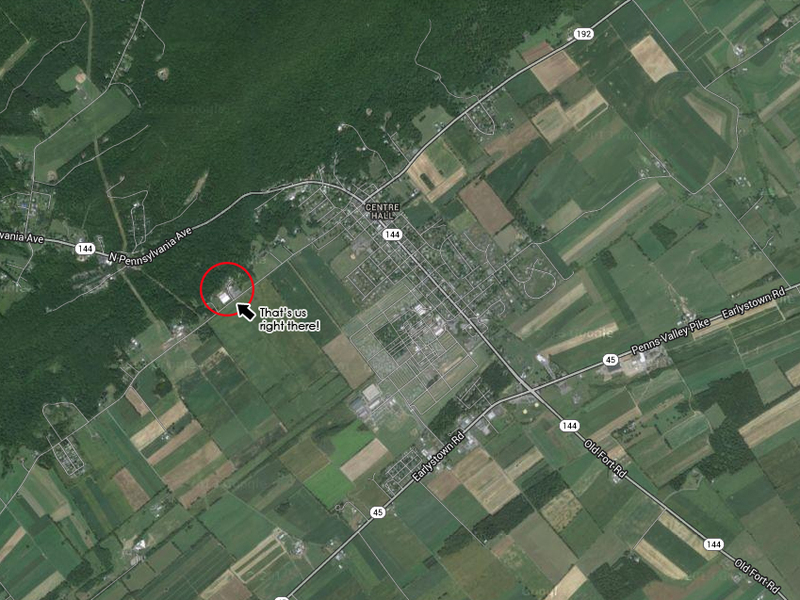 From Lewistown, via Rte 322: Head west on US-322; in Potter’s Mills, take slight right onto PA-144 North. Continue north, going straight through intersection at Old Fort (Snappy’s on left & Sheetz on right), continue through Centre Hall. At the next light (Brother’s Pizza on left), turn left onto W. Church Street and continue about a mile. Turn right into parking lot.